The size of three models corresponds to their mountable media with: 484 mm (19 in. ), 712 mm (28 in. ), and 1346 mm (52 in.). It enable to support variety of applications. 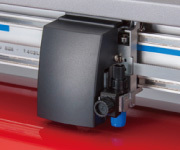 On the CE6000-120 PLUS, the pressure of the center push roller has 2 settings to suit all types of media. 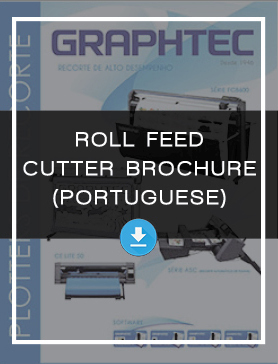 It prevents media lifting without leaving a trace mark and provides stable long-length cutting. This feature compensates for any skewing. ARMS system expands the cutting area to include outside of the area. When a design is printed using the matrix copy function, the marks are read and contour cutting is repeated for each copy. COPY key allows fast access for making copies of downloaded data. 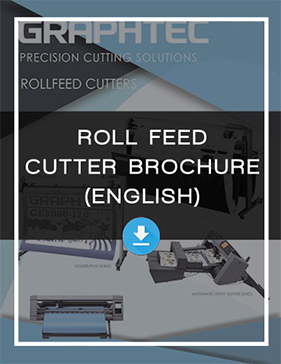 (*1) Operated with Graphtec specified cutting condition and media. For long-length cutting, the basket is used. (*2) For more information regarding OS / application software compatibility, please check the Graphtec website or contact your local representative of Graphtec. (*3) It is included only with CE 6000-40 Plus Series. (*4) In the CE6000-60 Plus Series, either the roll media stock tray or the stand will be included depending on the order.